How unique is your cat? Did you know that all tabby cats have the letter "M" on their foreheads? What about these other curious cats? Most owners like to think their cat is unique in some way. In fact there are several traits that are common in different breeds, some are really unusual. For instance did you know every tabby colored cat has the letter "M" on their forehead? Here are some other features you may not know about in every day domestic cats. 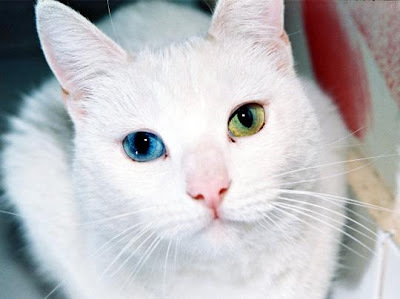 Known as Heterochromia, this cat has two different colored eyes. This can be genetic or the result of an injury. What is interesting is that this cat is white. It is not uncommon for blue eyed, white cats, to be deaf. In the case of cats with one blue eye, sometimes they are deaf in one ear. Cats can be born without a tail or with a tail shorter than usual. Cats can be born like this, or may also lose a portion of their tail if it gets caught in a door or from frost bite. The Manx breed is especially known for having shorter tails or none at all. Since this does occur in other cats, it does not mean the cat is a manx. Oh my, what big feet you have. 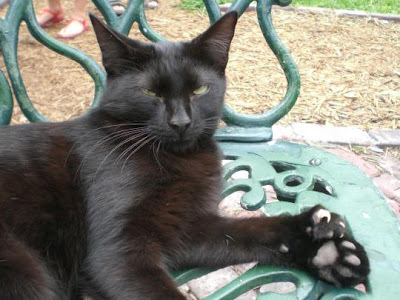 This is a Polydactyl Cat, if you are unfamiliar with this term, one glance at the cat should tell you what it means. The cat has extra toes. This can occur on one or more of the cats paws, and is often considered to be good luck. This photo was taken by Marc Averette of one of the cats at Ernest Hemmingway House. Now this is a normal house cat, in fact he is one of my own cats, left behind by his old owner when they moved away. 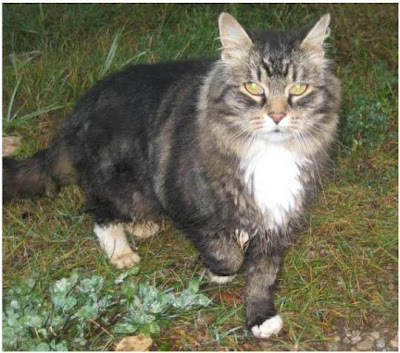 He is a terrific mouser on our farm but is also very friendly. He is here to demonstrate what often happens when you photograph a cat. Note his pupils in his eyes have turned yellow. This is a common trait in nocturnal animals, and is called Eye shine. What is special about this cat? Nothing really, other than that she is cool looking. How did I know the cat is female? Well typically all calico cats are female. 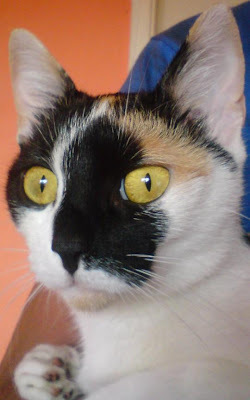 A calico is a cat who is white, black, and orange. She may also be white, gray, and peach (this would be referred to as a dilute calico). The same is true about Tortoiseshell cats, which are black and orange, or gray and peach. They are all generally female. A male cat of either coloration would is extremely rare, and often sterile. 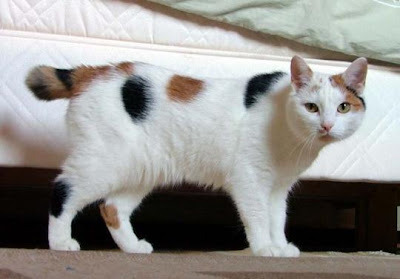 A very striking calico cat, from Wikimedia. I want to add, you may have recently heard about a cat named "Yoda" who has four ears, and may be wondering why he is not mentioned here. That is because his abnormality is limited to under five cats world wide, and I am mentioning occurrences here that may be rare, but you are still likely to encounter given the large number of cats in the world.